Shauna Letellier enjoys weaving strands of history, theology, and fictional detail into a fresh retelling of familiar Bible stories. She draws upon her Bachelors degree in Biblical Studies from Grace University in Omaha, Nebraska, as well as a variety of Bible commentaries to drape the fabric fiction over the framework of Scripture. Shauna’s writing has been published on The Huffington Post, Day Spring’s InCourage, The MOB Society, and in MomSense Magazine (now Hello Dearest), a publication of MOPS International. She is the author of Remarkable Faith: When Jesus Marveled at the Faith of Unremarkable People, (FaithWords, 2017). Connect with her on Facebook and Instagram or at www.shaunaletellier.com. "I LOVE it!!!! So fresh. Stirring. Convicting. Don’t hesitate to get your copy today! ~ Gwen Smith, speaker, author worship leader, and co-founder of Girlfriends in God. "Shauna has created a gift for all of us as we approach the celebration of the birth of our Savior. I was captivated by the rich, historical detail that deepened my understanding of this ancient culture, and wanted to read more than a day at a time. She’s done an incredible act of service for believers and skeptics alike, and I’m so grateful." 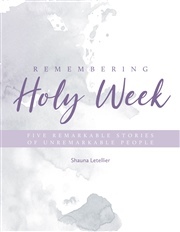 ~ Jen Babakhan, writer for Readers Digest,"
"With the same captivating storytelling found in her book Remarkable Faith, Shauna makes me feel like I’m reading the Christmas story for the first time. I’ve tossed dozens of Advent devotionals in the past for lack of substance, but Shauna’s beautiful book will be a resource I come back to again and again." ~ Glenna Marshall writer, speaker, and singer-songwriter. 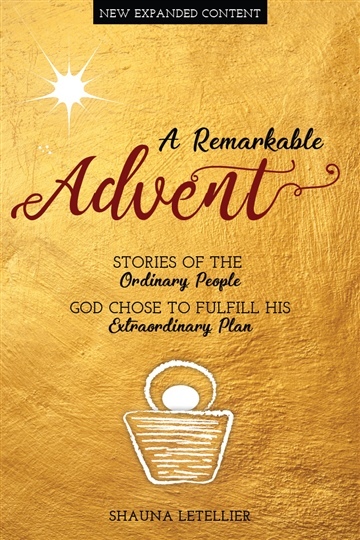 "Shauna’s warm invitation into the Christmas story fills my soul with wonder and delight. I love the way she brings each theme to life with details, nuances and colors I haven’t noticed before.” ~ Dorina Lazo Gilmore, mama of 3, children’s writer, speaker, and author of Glory Chasers. "I wasn’t even aware how desperately my soul needed A Remarkable Advent, but the hustle of the season, needs of my people, and familiarity with the Christmas story had caused me to no longer be awed by the events of so long ago that changed everything. In reading, I felt my soul reawaken to the miracle was reminded that this good God is still very much at work in my very own life." ~ Sarah Sandifer, writer, military wife, and mama.